Chapaev & Petka © 200? Casino Technology. 5-reel 15-line video slot based on the ludicrous deeds of the famous Red Army captain Chapaev and his friendly sidekick Petka. It features some classic Russian symbols, such as accordions, bullets, red stars, and the Kremlin tower. The on-screen bonus is tempting the player to take his chances on a 'Russian roulette'. On the 2nd bonus screen there is a wonderful drinking competition between Chapaev and Petka. 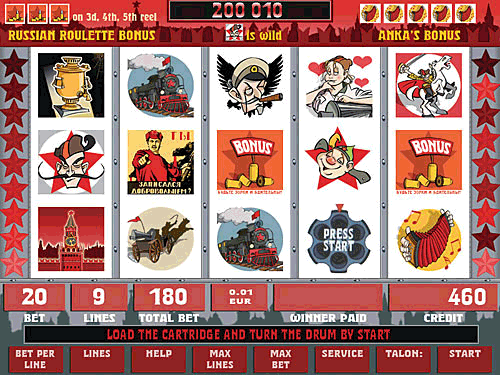 Bonus game Russian roulette : By pressing Hold button the Player selects one of the three bonus symbols to switch on the screen with an empty revolver drum. By pressing START the player places a cartridge into the drum and spins it around. If there is a bullet in the barrel after the drum stops, the bonus quits and the Player gets the win Total bet x 3. If there is no bullet, he may 'shoot' once again or take the current win by pressing HOLD5. The Player can try up to five 'shots' and to win the following prizes : First cartridge in the drum and a lucky 'shot' pays Total bet x 10; 2nd, 3rd, 4th and 5th cartridges - Total bet x 16, Total bet x 33, Total bet x 100 and Total bet x 600 correspondingly. Anka's Bonus : A new screen appears with Chapaev and Petka sitting at the table in front of a rotating tray with 5 glasses of vodka. By pressing START the tray stops and both of them drink the glasses in front of them. Every glass drunk by Chapaev gives some winning points to the Player. Chapaev and Petka go on with drinking (by pressing START) until one of them drinks in excess of the quantity shown on the bottles behind them and falls onto the table. Then the bonus quits and the Player takes the current winning points. Depending on the level of the total bet, Anka may blow a horn in Chapaev's ear, which makes him soberer by 500 ml, or she may unbutton her blouse, which makes him soberer by 1000 ml.